Between being pregnant and feeling like crap and managing to miss two stairs while walking down them and breaking my ankle (which the ER said was just a sprain so I walked on a broken ankle for 6ish weeks) I haven’t felt much like baking. I recently took my son and went to Vermont for a vacation. We were with my parents at their cabin on a lake and at their house. While we were at their house I requested zucchini chocolate cupcakes and my Mom asked if she made them if I’d post them. Sure I said!! Win win situation. I get one of my favorite cakes, get to finally post something on here and don’t have to do ANY of the work! Thanks Mom!! We have no idea where this recipes comes from. It was my Grandma’s who may have possibly gotten it out of a magazine, or maybe from a friend. A lot of our family recipes are like that. As you can see from the picture my Mom’s hand written copy is well loved! 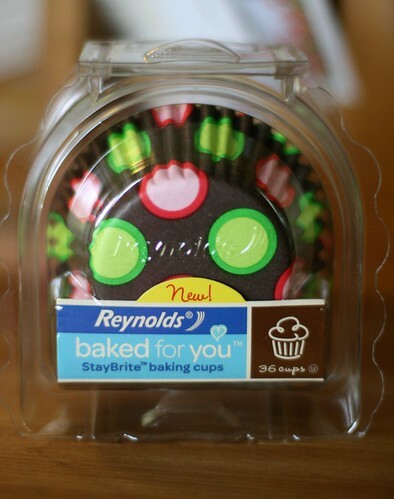 I decided to try some of the Reyonlds StayBrite cupcake liners. Mostly because I had been looking at them and while I was in Vermont we went shopping in New Hampshire (closest grocery store) and I could get them tax free PLUS they were a dollar cheaper than at my grocery store here in New York. FYI, in case you don’t, say, read the packaging like me, these are aluminum liners on the inside with paper on the outside. I was surprised. No idea why as these are made by aluminum foil company. I guess I’m not too bright. My parents have a nice garden where the zucchini was grown. 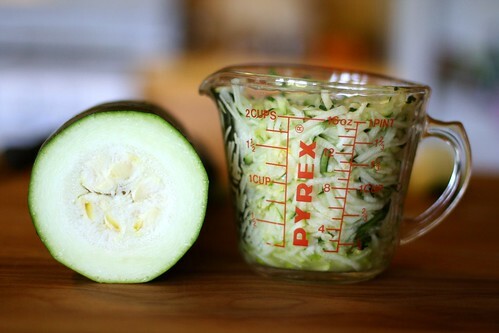 My family has always used the huge zucchinis for baking. Because they’re seeder and tougher than the little zucchinis and why just throw them away when you can shred them to make breads or cakes. Shredding them is really easy with a Cuisinart. I don’t have one of those in my tiny kitchen so I’m very happy these were made my Mom’s house who does have a Cuisinart. The recipe says to add all the dry ingredients and then the vanilla, zucchini and milk. My Mom found that she needed to alternate milk and dry otherwise it was a dry mess that was impossible to combined. 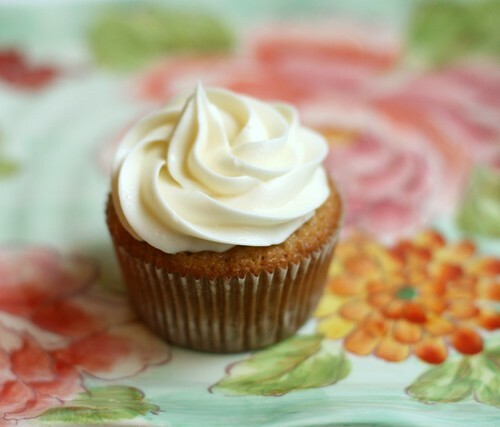 The smell of these cupcakes baking smelled like Grandma’s house. Yes my Mom has made the recipe many times, but I spent a lot of my summers as a child at my Grandparent’s house playing and just hanging out. So this is just one thing that smells like Grandma, like Grandma’s house. Very nostalgic and made me miss her a lot. 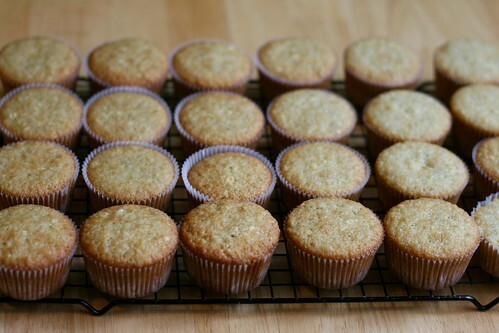 I don’t have a picture of the baked cupcakes minus frosting. My nieces came down to play with my son and things got busy. Also the making of the frosting isn’t really picture worthy. You’re basically just standing over the double boiler with your hand mixer until it suddenly comes to together and then you’ve got to work quick before it starts to get crystally and really stiff. Those words probably don’t make this frosting sound good but oh man. It is soooooo good, especially on this cake. I’m not sure I’ve ever had it on any cake but chocolate zucchini. Cream butter and sugar, then beat in eggs. 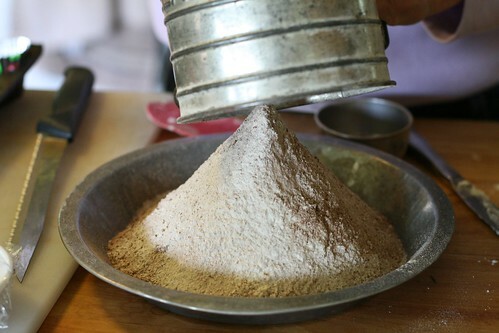 Sift together and add flour, baking powder, soda, cinnamon, salt and cocoa. Mix well. Add vanilla, zucchini and milk. Stir until well blended. Spoon into cupcake tins. Bake at 350 degrees. Makes about 25 cupcakes. 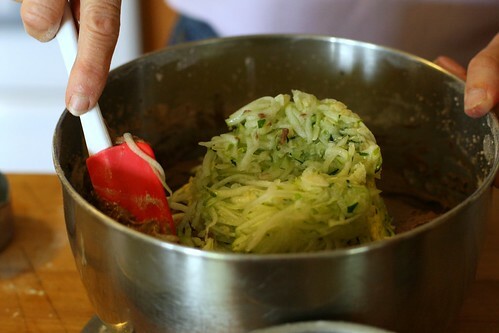 Beat one minute with rotery beater set over boiling water and beat until stiff enough to stand up in the peaks. With electric beater the frosting may be stiff enough in four minutes. Remove from the heat and continue beating until thick enough to spread, add 1/2 teaspoon vanilla. 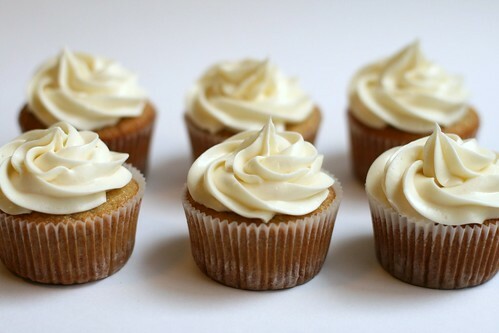 This was actually supposed to be called banana cupcakes with banana cream filling with cream cheese frosting. However I had a total fail when it came to the banana cream filling. I had never made a cream filling before so I took a TON of pictures of that process. Which leaves me with very very few pictures of everything else. 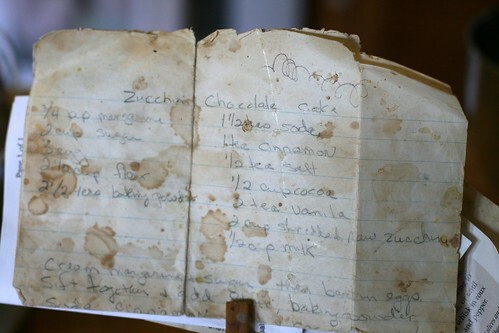 This recipe is actually a cake recipe from The Fannie Farmer Cookbook, which tends to be my family’s bible of cookbooks. The recipe says it makes a 9 inch square cake so I doubled the recipe. That means four bananas. I underestimated how much room four bananas takes up and used a slightly too small bowl. So I dumped it all into a bigger, yet still too small bowl but managed to finish mashing them with a fork. As I said I doubled the recipe. I ended up with 24 normal sized cupcakes and 24 mini cupcakes and still had a small amount of batter left over that I sadly threw away as my oven was FULL. My mom has made this recipe before for cake and it’s delicious. The cupcakes came out nicely too! It was at this point that things went horribly wrong. See the recipe says to slice the cake in half and fill with banana cream filling and frost with some weird frosting. I emailed FireMom from Stop Drop and Blog to see what she thought about the various ways I make these and she thought that the banana cream filling with cream cheese frosting sounded good and so did I. I made the cream filling minus the vanilla plus a banana like the recipe says. I snapped picture after picture of the process. Everything was all well and good. Once it’s cooled you’re supposed to add the banana with lemon juice (so it doesn’t brown I guess). I had small to medium sized bananas and when I tasted the banana and lemon juice it was very lemony so I added another half of a banana. Then I added that to the rest of the cooled, very thick cream filling. That’s where something went wrong. It got very very runny. I thought maybe it would be okay and poured it into a pastry bag that I was going to use to squirt some of the cream filling into each cupcake. It ran right out the bottom. That’s when I poured everything down the drain and decided I was too tired and it was too close to my son’s nap time being over (plus I nearly out of bananas) to bother trying that again and just got to making the cream cheese frosting. 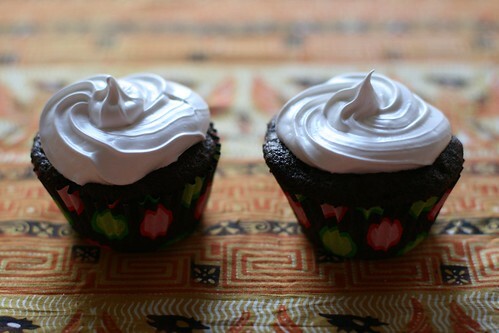 I didn’t bother taking any pictures – I blame my frustration and eagerness to just get these cupcakes DONE. While they didn’t have the banana cream filling these cupcakes are very good. Lighter than banana bread and just the perfect afternoon treat and great with a latte. Preheat oven to 350°. Butter and lightly flour a 9-inch square cake pan. 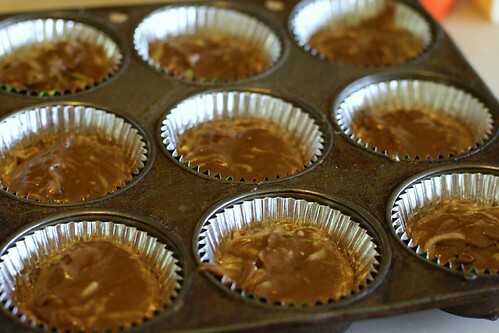 (I just used cupcake liners) Cream the butter or shortening, slowly add the sugar, and beat until light. Add the banana, eggs, and vanilla and beat well. Mix the flour, baking soda and salt, add to the first mixture and blend. Slowly add the sour milk or sour cream and beat until well blended. Spread in the pan and bake for about 45 minutes (I filled the cupcake liners around 3/4 full and checked on them after 15 minutes. I think at most I cooked them 20 minutes) or until toothpick comes out clean. Cool in the pan for 5 minutes before removing to cooling rack. 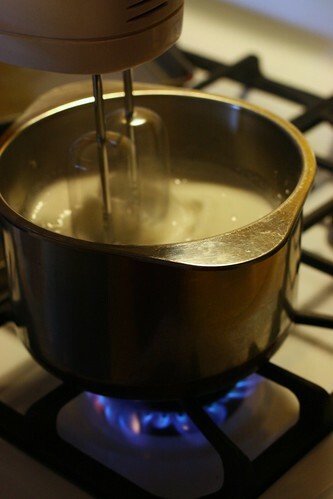 Heat the milk in a heavy-bottomed pan until very hot but not boiling. Mix the sugar, flour and salt together in a bowl, stir in the hot milk and beat until well blended. Pour back into the pan and continue to stir vigorously over low heat 4-5 minutes, until very thick and smooth. Add the egg yolks and cook for a few more minutes. Cool, stirring from time to time. 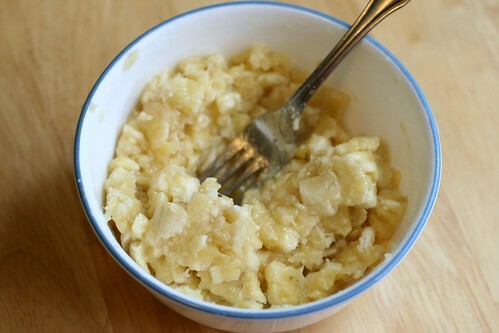 Mash the banana and beat it until smooth, add the lemon juice and stir the mixture into the cooled filling. Combine the cream cheese, butter, confectioners’ sugar and vanilla in a mixing bowl or the bowl of a food processor. Beat well or process until perfectly smooth and spreadable. You will have enough to fill and frost an 8-inch two-layer cake.